The digital champions network in Department of Health has now entered its third year - and it has started with a bang. To relaunch the champions we first took a step back to think about how the network has operated in the past and how it should evolve to best reflect the needs of staff in the context of a changing department. 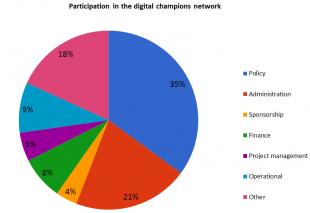 In previous years, we’ve used our network of champions to help drive up basic digital skills. That mission isn’t quite complete, but we’ve shifted our focus to putting expert capability where it’s most needed. We need our new cohort of champions to be motivated, self-driven staff, keen to develop their own skills digital awareness, whilst acting as true ambassadors for digital ways of working. In the past, we’ve also insisted that every team in the department should have a champion. But we want motivated self-starters, not individuals pushed into it by a line manager under pressure to fill a quota. So this year all of our champions are volunteers. As it happens, we’ve still managed to get a representative in every division and have a broad coverage of all the different roles in the department. We’re keen for the champions to form a community which can share information and help itself. We were also keen to give champions a chance to put names to faces and to ask us questions in person. To do this, we decided to hold an induction event. Overall, what a success! Themed around the future of Government in a digital age, we hosted some superb talks which really gave food for thought to the Champions about how we can adapt to and take the most from digital. The was opened by Adam Bye, welcoming the Champions and setting the network into the context of the move towards a leaner and more efficient Department of Health. Stephen Hale, then gave an ardent reminder about what digital actually is, and how internet culture, and people's exposure to services like Tinder, have changed their expectations about interacting with government. Stephen’s talk was followed by Laurence and I presenting an overview of the role and what the Champions could expect in it. A brainstorm about re-imagining government in a digital age set the scene for the rest of the day. And this was followed by a passionate and humorous talk by Tamara Finkelstein, Director General for Group Operations, emphasising the network’s importance for the department’s future, and inviting champions to make suggestions to the department’s senior leaders. Janet Hughes from GDS then gave a truly inspiring presentation about what the future of Government might look like by 2030. Whilst we really can’t be sure what the future will actually look like (who would have imagined we’d all have the internet in our pockets in 2000? ), we do know that it will affect everybody and that there are many people across government working on similar issues who are able to help each other. Transformation isn't always easy, but it is clear we must be bold, positive and open to embrace new technologies that will ultimately improve the way we work! Nayeema Chowdhury shared how digital methods have been put into practice through our NHS.UK Alpha project. This project is a fantastic and real-life example of how digital ways of working have enabled swift and efficient development of a service focused on responding to user needs. Finally, we welcomed Alex Nisbett from Live Work to talk about how user research has been applied to policy and service development. Examples from Norway and the UK illustrated the versatility of the approach which has transformed service design for both public and private sector partners. 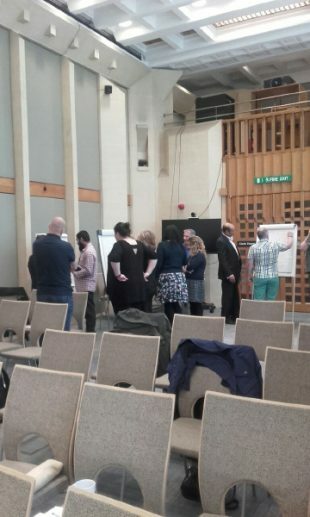 The day drew to a close with an energetic rapid prototyping activity, asking champions to re-imagine some core DH processes for the digital age. Left: An example of rapid prototyping for a digital age - from connecting to appraisals. 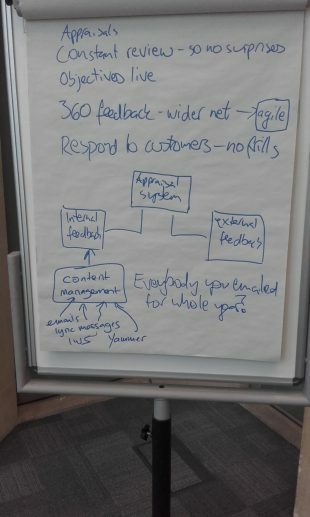 True to our method, we conducted a retrospective of the day. We identified what went well and less well, and made lots of suggestions about what we might do differently next time. We’ve definitely learned some lessons about managing events like this (early planning, timekeeping, more time for conversations, laptop logistics). But we had excellent engagement from the champions attending, lots of questions and all agreed the speakers were interesting and covered a broad range of relevant topics. Let’s look forward to an even better event next year!